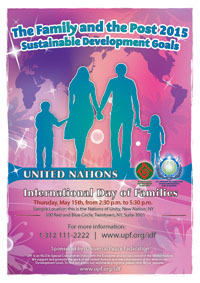 Welcome to the UPF resource page for the Marriage and Family Initiative and the UN International Day of Families observances. Here you will find a variety of materials to help you create a successful program, including flyers, banners, program guides, and other resources. Click on the tabs below to see the resources for each section. We offer two options for each session. You can decide which option works best for you; and it is fine to take Option A for one session and Option B for another session, just as you like. You don't have to follow the entire schedule, or have all the sessions, or have them in the sequence shown here. You can also substitute in your own content, and if you do, please let us know what you did and how it worked out. For more information or to discuss a proposed program, you can email UPF's Director of Marriage and Family Education, Mrs. Lynn Walsh. Why get married? Why stay married? This interactive session invites people to contribute their responses and promotes a vision of the family as the school of love. 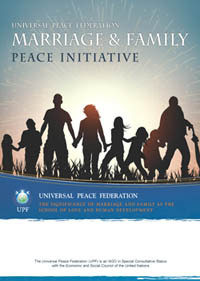 Research findings on the benefits of marriage to both the couple and their children are introduced and discussed. Building on “The Benefits of Marriage” presentation, this interactive session introduces strategies to promote strong and stable marriages. Group discussions stimulate people to make plans for additional ways their community and nation can support thriving, lasting marriages. 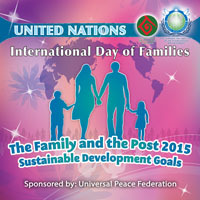 The family is the primary human institution and is considered sacred by religions throughout the world. This presentation explores how people grow in love through family relations and learn to related with others as members of the broader human family. The World Peace Blessing is introduced as a public commitment to honoring the oneness of the human family. 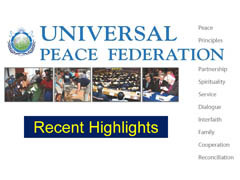 Universal values, expressed in the world’s religions, guide our personal behavior and relations with others. Created in the divine image as male and female, we are called to exercise both freedom and responsibility as we grow in love. This presentation describes human sexuality, consummated in marriage, as sacred and the origin of love, life, and lineage. Somehow we forget how different our spouse is from us and yet we want them to understand us or do things the way we would. If we want to bridge some of the gaps, the key is effective listening. But research has shown that most of us do not listen well (and many spouses would say the same). In this session we introduce some tried and true listening structures that promote empathy, deeper understanding, and emotional safety. These skills are practiced in this session so the participant can get a sense of how to bring these skills home to spark better connections. What to do when your teen’s behavior is scaring you out of your wits? If the family is the school of love, parents are the teachers. How we respond when we are upset with our adolescent offers a challenging but important opportunity to teach about relationships and values. This interactive program gives parents opportunities to learn skills that build positive relationships with their children while modeling good communication. This presentation introduces God’s original ideal of the family and how it was broken by the human fall that corrupted love and divided people from one another and their creator. The World Peace Blessings, instituted by Rev. and Mrs. Sun Myung Moon, are central to their vision of bringing together the human family under God, transcending boundaries of religion, race, culture, and nationality. Marriage provides us with the most fulfilling and personal challenge: how does one imperfect person learn to truly love another imperfect person? Most of us tend to think, “If he or she would only do this or be that, then I would be happy.” However, when we see marriage as a spiritual path for our growth, the change in our perspective can be the change we are actually looking for. In order to have citizens capable of creating peace in the world, we need stable families that instill values and capacities for peacebuilding. 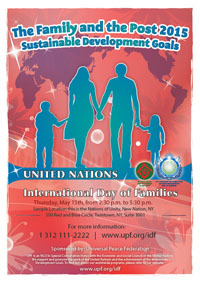 Marriage and the family serve a unique and essential purpose for optimum human development. Research is showing that straying from that purpose weakens the family, increasing disadvantages for the next generation and the future. 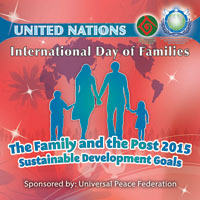 Clarifying the value of the family will help us strengthen this essential building block of peace. 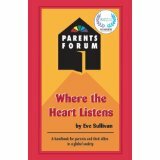 Where the Heart Listens describes Parents Forum, a program based on thoughtful examination of eight original questions about family life issues. The workshops, designed by Eve Sullivan and Christine Bates, develop parenting skills and are suitable for various settings. While nothing replaces the experience of a Parents Forum workshop, Where the Heart Listens serves as a "workshop in your pocket" and can help parents, children, and all family members improve their communications skills. ¿Cuál debería ser la relación sexual ideal entre marido y esposa?